As well, the FOMC voted to keep its QE2 program of long-maturity Treasury purchases intact. There will be essentially only one more opportunity for the FOMC to meet (April 26-27) before the QE2 program ends (the June 21-22 meeting is essentially irrelevant for the program), so the net purchase of $600 billion in long Treasuries by the Fed during the period of early November 2010 to June 2011 seems assured. FOMC participants see inflation remaining low; most project that overall inflation will be about 1-1/4 to 1-3/4 percent this year and in the range of 1 to 2 percent next year and in 2013. Private-sector forecasters generally also anticipate subdued inflation over the next few years.3 Measures of medium- and long-term inflation compensation derived from inflation-indexed Treasury bonds appear broadly consistent with these forecasts. Surveys of households suggest that the public's longer-term inflation expectations also remain stable. Thus, the consensus projection of the FOMC is that the inflation rate should continue to be below the Fed's 2% implicit (explicit?) target, even two years out, in spite of an extended period with the interest rate on reserves at 0.25%, and the large expansion in the size of the Fed's balance sheet. Here I'm inferring that "extended" could mean as much as two years. While it is certainly true that there is nothing alarming on the inflation front if we look at what forecasters are predicting and the yields on TIPS, maybe we should examine some other evidence. What's the goal here? Fed people, including Bernanke, make vague statements about a 2% inflation rate being what the Fed is shooting for. But what does that mean? Do we set the target at 2% in January and then say that we achieved our goal if the year-over-year inflation rate as of the next January falls between 1% and 3%? If we exceed the target are we going to have a lower inflation target for a while? I thought about the costs of inflation earlier, in this post, and would make the case that price level targeting might work well. Suppose, for example, that our target price level path is 2% inflation forever. Then, intervention by the Fed which always aims to hit the target path within a relatively short period of time (say a quarter or two) should minimize the uncertainty in real interest rates over any horizon. I think real interest rate uncertainty is a key cost of variable inflation, if not the primary one. Most debt is denominated in nominal terms, default is costly, and uncertainty is costly. Just ask Paul Krugman. So, suppose for the sake of argument that we are shooting at a two-percent-inflation price level path, and take January of 2007 as our base year (no particular reason). The first chart shows the 2% price path target and the actual paths for some standard price level measures: headline cpi, the core cpi, and the personal consumption expenditure (pce) deflator. My concerns here are the following: (i) Maybe these price increases are not temporary; with the world economy coming back (problems in Japan aside) and very strong growth in some places, resources in the world are becoming increasingly scarce. (ii) Inflation is inflation. I make the case here for looking at broader measures than core price indices. (iii) Public relations: What people see is headline inflation; indeed the prices they observe most frequently are food and energy prices. If the Fed speaks to core inflation, it can end up looking devious. What about the future? What causes inflation? Some people, including Christina Romer, think that inflation is all about Phillips curves. According to these people, if we get more inflation than we bargained for, that would be no problem. In their view, we have a long way to climb up the Phillips curve, a huge output gap, and plenty of spare capacity. Of course Christina and her fellow Phillips-curve types seem to want to ignore the 1970s. The mid-1970s US economy was of course not identical to what we see today, but some of the same factors were at play. Recently there has been a runup in commodity prices, real GDP and employment have taken a hit, and there is an accommodative Fed working in the background, all of which were also true of the mid-70s. That earlier period of course demonstrated the prescience of what Milton Friedman said in 1968, which was that the Phillips curve was not a structural relationship that could be exploited by policymakers. Now, Milton Friedman also said some other things. He said that "inflation is everywhere and always a monetary phenomenon," which I think is correct. Friedman was off-base though, in terms of another thing he said in 1968, which was that we could get good results if central banks were to target the growth of monetary aggregates. Unfortunately we tried that, and it did not work. Central banks have found that what works well is to target some overnight interest rate over very short periods of time (which seems to efficiently absorb very short-run shocks), and some of those central banks manipulate the overnight interest rate target to achieve some medium-term inflation target. So why am I saying that Friedman was right about money being the source inflation? Ultimately, it is the demand and supply of outside money - reserves and currency - that determines the prices of goods and services in dollars. The problem is that the demand for outside money fluctuates in unpredictable ways. 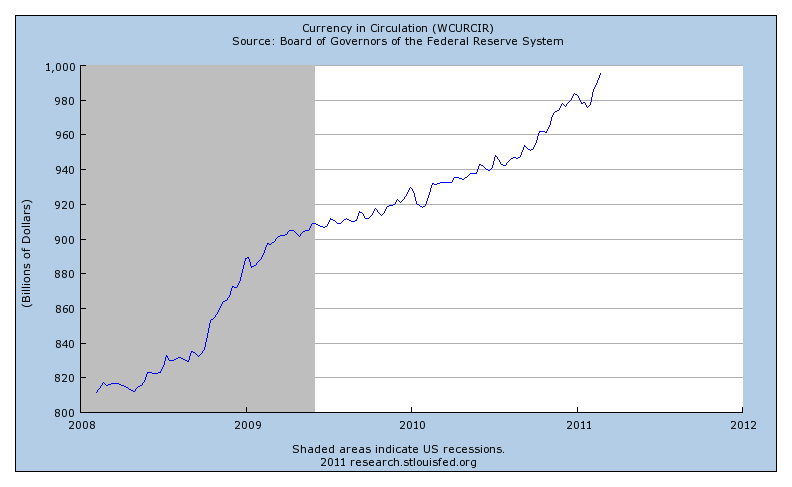 This problem is even more acute for the US, as some large and unknown fraction of US currency is not held domestically. So what has been happening to the stock of outside money? As you might imagine, given the QE2 program, the stock of reserves is now a lot larger than in November, as you can see in the next chart. The increase since early November is about $400 billion (2/3 of the total asset purchases planned), or 154.2% at annual rates. Milton Friedman would of course think this was massive, but we have now become accustomed to seeing massive quantities of reserves on the liabilities side of the Fed balance sheet. We recognize that reserves that just sit overnight are roughly like Treasury bills, and need have no inflationary consequences if the reserves are retired in the future, for example by reversing the asset purchases. What about the stock of currency? That has been growing substantially as well, though what we are seeing may or may not alarm you. In the last chart, you can see that the stock of currency has been growing at an increasing rate, indeed at an annual rate of 10.6% since the inception of the QE2 program. If sustained, and assuming constant velocity and 4% GDP growth, we would get something approaching 7% inflation, which I think would start to make people unhappy. We have all the tools we need to achieve a smooth and effective exit at the appropriate time. 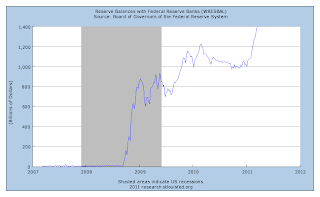 Currently, because the Federal Reserve's asset purchases are settled through the banking system, depository institutions hold a very high level of reserve balances with the Federal Reserve. Even if bank reserves remain high, however, our ability to pay interest on reserve balances will allow us to put upward pressure on short-term market interest rates and thus to tighten monetary policy when required. Moreover, we have developed and tested additional tools that will allow us to drain or immobilize bank reserves to the extent needed to tighten the relationship between the interest rate paid on reserves and other short-term interest rates. If necessary, the Federal Reserve can also drain reserves by ceasing the reinvestment of principal payments on the securities it holds or by selling some of those securities in the open market. The FOMC remains unwaveringly committed to price stability and, in particular, to achieving a rate of inflation in the medium term that is consistent with the Federal Reserve's mandate. 1. All of the necessary conditions are there for a substantial inflation. I'm thinking of something on the order of 5% to 10%, and once it gets going it will be costly to stop it. The total stock of reserves will rise to about $1.6 trillion by the end of June, and that represents an accident waiting to happen. Right now, as Bernanke points out, financial markets are taking the Fed at its word. The margin between TIPS yields and nominal Treasury yields is not very large, reflecting modest anticipated inflation. But if people start to anticipate that the Fed will not be reducing the size of its balance sheet any time soon, and start to anticipate higher inflation, then nominal rates of return on assets will rise, making reserves undesirable to hold. The Fed can make reserves more desirable to hold by increasing the interest rate on reserves, thus cutting off the incipient inflation, but it will have a hard time doing that. Unemployment may still be high and employment growth slow, and the Fed may not want to be blamed for slowing the recovery. Further, the Fed has locked itself into a portfolio of long-maturity assets which will drop in value if short-term interest rates go up substantially. Ultimately, the Fed may not have the stomach to fight the inflation, in which case the higher anticipated inflation becomes self-fulfilling. 2. Bernanke makes it sound like the Fed has a lot of tools. Surely with so many tools, things have to work, right? However, there are really only two instruments that matter in these circumstances: the interest rate on reserves, and the quantity of assets in the Fed's portfolio. 3. If all hell breaks loose, there could be conflict on the FOMC. With a positive stock of excess reserves in the system, it is the interest rate on reserves that matters. The fed funds rate target is irrelevant. But the Board of Governors sets the interest rate on reserves. What if the Board and the regional Fed Presidents who vote on the FOMC disagree? What happens then? Ben Bernanke wants you to think that everything is OK. Policy is proceeding in a normal fashion. We understand what is going on. I think the truth is that he is making it up as he goes along. The Fed has undertaken a risky experiment. I can see ways in which this will not turn out OK. Maybe I'm wrong, and that would be good. y/y% change in Currency in Circulation is 7.3%, barely above its 6.8% series mean, and a hell of a closer to its series low (-5%) its series high (21%). The monetarist perspective is being exposed day after day, as extremely strong productivity combined with a persistent output gap continue to hold down prices despite rising cost-push inflation and ZIRP. Statistically, Reserve Bank Credit actually is *led* by prices: not the other way around. John Cochrane in the European Econ Review Jan 2011 is saying that inflation is a fiscal phenomenon. He gets to the same result as you, that an upturn in the inflation rate is a distinct possibility. Ron Paul unforntunately will be proven right. "there is an accommodative Fed working in the background"
By what metric is current Fed policy accommodative? 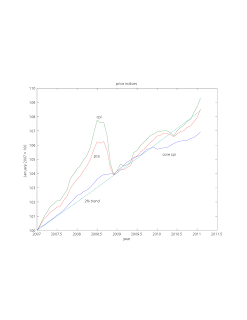 NGDP growth and inflation have been well below their target or trend. Real interest rates are too high. Unemployment is clearly above the 'natural' rate. Which is exactly why neither markets nor forecasters see inflation coming anytime soon. Lots of people believe some form of the Phillips curve, and there's still a lot of slack that looser policy can take up before its starts to seriously feed into core inflation. But much more important than that, policy has been tight recently, and in the face of devastating unemployment. There's no reason to believe the Fed won't have the stomach to fight inflation when that's most of what they've been doing the last few years. The most extreme proposals (as far as I know) from people on the FOMC has been to raise the inflation target by a couple percent. Even the doves would balk at 7% inflation. I don't really see how IoR isn't more or less the end of the discussion when it comes to managing the mass of excess reserves. Is there some technical reason it wouldn't work to immobilize pretty much whatever the Fed chose to keep in the system? And it seems superior to the short rate in other ways: its not as well-known or understood in the media, so it would be a less controversial move; and, as you said, the Board sets IoR rate, so doesn't need the support of the regional Feds. It may not be very nice, but I would think it would a comfort to those worried about inflation that IoR decisions can be made over the objections of those likely to oppose it. "The monetarist perspective is being exposed day after day,"
I'm certainly not a quantity theorist, as I hope I've made clear. But money growth is money growth. If there is enough of it, then given productivity growth, output gap, or whatever, prices will rise. Yes, I agree with Cochrane, to the extent that I think that it is important to think about the consolidated government. The outstanding quantity of nominal debt and its composition are important. Sometimes Cochrance seems to be saying that the composition is irrelevant, which I don't think is right. No, this is still better than no Fed. How could the Fed be more acccommodative? The fed funds rate has been close to zero for more than two years, and the Fed seems to be planning for another two. 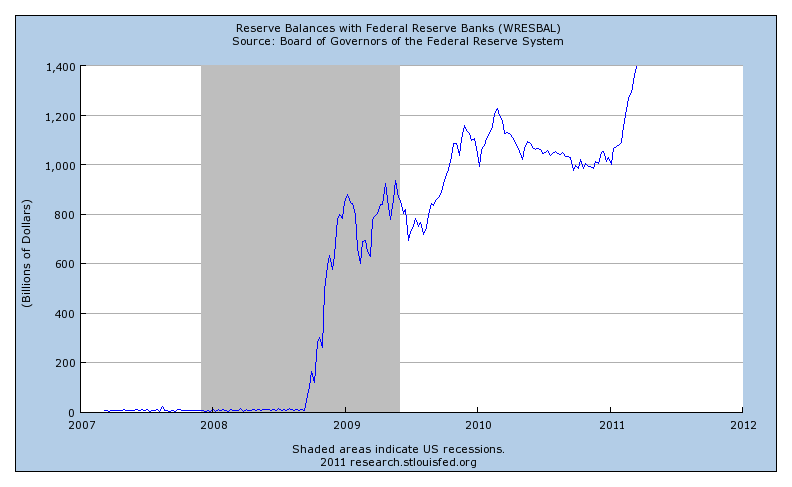 The size of the Fed's balance sheet has roughly tripled. I suppose QE2 could have been $1 trillion instead of $600 billion. That would have been more accommodative. The idea that fiscal policy is important for the effects of monetary policy and for inflation is an old one. In the 1980s, Minnesota people were interested in that. You can see it in Sargent and Wallace's "Unpleasant Monetarist Arithmetic," in Sargents "End of Four Big Inflations," and in Wallace's "Modigliani-Miller Theorem for Open Market Operations." All that stuff is useful. The choice of base month matters. If I choose July 2008 as the base month than headline CPI since then has been 0.6% and core CPI has been 1.2%. headline inflation is as often below the core as above it. In fact, using 1982-84 as a base both have averaged 2.9% since then and the headline index only ever exceeded the core index from May to October of 2008. (i) Even if the commodity price increases are not temporary it will not matter. They may lift the price level but they will have no effect on the inflation trend. And eventually there may be substitution away from these goods. (ii) The inflation trend matters more than temporary spikes one way or the other. Headline inflation is skewed by such spikes and has actually lagged core since July 2008. (iii) There's no need to indulge the public. We should be educating them, not pandering to them. And what if the inflation/RGDP mix ends up being 9 and 2 instead of 7 and 4? Do you have any reason to believe that 25 million unemployed/underemployed and an equivalent amount of unused capital is now worthless? In short I believe the AS curve is flat as a pancake right now. P.S. I believe Friedman (along with Phelps) also came up with something called the Accelerationist Hypothesis. According to it as long as unemployment is this high we should not be the least bit worried about accelerating inflation. I meant "2 and 9" of course. How could the Fed be more accommodative? It could lower IOR to 0. What is the purpose of keeping the rate at 0.25%? The effect of lowering it might by marginal, but it would least end what is a contractionary policy. It could commit to keep doing QE until inflation expectations are back at 2%. Or even better, it could (as you suggest) commit to a price level path and to making up for the "missing" inflation over recent years. What is the downside of raising prices back to their pre-2008 2% growth path? The inflation shortfall hasn't been huge, so it wouldn't take any more than ~3% inflation over a couple of years. Who loses by this? As far as I can tell, only creditors who made loans in the last couple years. Other debts would merely be returned to their expected real value when they were contracted. I don't understand why we just give up on monetary policy once the zero-bound is reached. What really is the difference between standard OMOs and QE with other Treasury securities. They could even focus only on short-term securities and ignore the interest rate channel if purchases of bonds bother people so much. This also reduces or eliminates their capital losses if long-rates rise. As an aside, why are people worried about losses on the Fed's balance sheet? It's something I've never understood. What does it matter? 1. Yes, choice of base year matters a lot. If you were going to do price level targeting you would have to think carefully about the science behind the choice of the base year. 2. Yes, even if the commodity price movements are permanent, those are changes in relative prices. To maintain a stable inflation rate, some prices (in dollars) would have to rise at lower rates than some other prices. Sticky price people worry about things like that. Other people don't. 3. One view of the QE2 program is that this is indeed just an exercise in "indulging the public." In this view, there is little chance this has any effect on the number of unemployed, but people will think the Fed is trying to do something about it. 4. AS/AD? Not a good way to be thinking about the state of the world. 5. It's hard to speak for Friedman of course, but I think he would be worried about the wild gyrations in policy that your accelerating inflation might produce. You need to think about the whole future dynamic path. 1. I was wondering at some point (you can look through my posts - can't remember where I discussed it) why the Fed would not take the IROR to zero. Seemed like they should just do it if they wanted more inflation. Bernanke talked about it, I think in his Jackson Hole speech - mentioned "technical" reasons I think. As far as I can tell this has something to do with money market mutual funds and how they are regulated - the "break the buck" issue. 2. Yes, committing to the price level path would be a fine idea. Not sure why this is not on the table. Maybe it is, but we don't know about it. 3. QE: The problem here is (i) The effects of purchases of long-maturity Treasuries at the zero lower bound (more or less) is not well-understood. (ii) To the extent that it has any effects, this would have to come from some advantage the Fed has in intermediating across maturities. Not clear what that advantage is. 4. On losses on the Fed's balance sheet: Here, you have to worry about the consolidated balance sheet of the federal government and the Fed. A loss has to be made up somewhere, either through taxation, issuing more Fed liabilities, or issuing more nominal Treasury debt. This is where Cochrane's (or Sargent/Wallace's) ideas come in. This just comes back to bite you in some way - it's then just a matter of how you spread the losses around. If we're going to do price level targeting (and I agree that's a good idea) then the choice of base year matters less if you use core inflation (or better yet, my preference, trimmed mean PCE). NGDP level targeting however would be even better IMO. QE2 certainly has had a nominal effect as inflation expectations (by several measures) have recovered nicely since Jackson Hole. It is of course debatable whether it has had a real effect yet but it is worth noting that the unemployment rate has just had its first meaningful decline, and the household survey employment number its first meaningful increase, this "recovery". And looking at your response to Alexander, I favor a gradual elimination of IOR. In fact I suspect without IOR, QE2 would probably have been unnecessary. Bernanke is a fan of the credit channel MTM, so it's implicit IMO that IOR is really a means of propping up the financial sector. 1. I've heard about "trimmed mean PCE," but don't know what it is. How do you modify the raw PCE to get that? 2. NGDP targeting seems a special case of a Taylor rule. To know whether this works well or not, you have to take a stand on where the nonneutrality of money is coming from. 3. Yes, I think there was a bit of panic running through the Fed about the prospect of deflation. Whether that was a real threat, I'm not sure. In any event, judging from the TIPS/nominal yield margins, QE2 was a success in increasing anticipated inflation. But maybe they went overboard. 4. Eliminating IOR is, I think, a bad idea. There are well-known efficiency arguments for it, and the Canadians and others have done a nice job of implementing it. 1. You're either being tremendously modest or you're playing with my mind. Any US economist who considers themselves an expert on Monetary Theory should know what trimmed mean PCE is if only to have an opinion about it. However, calculating the trimmed mean PCE inflation rate for a given month involves looking at the price changes for each of the individual components of personal consumption expenditures. The individual price changes are sorted in ascending order from “fell the most” to “rose the most,” and a certain fraction of the most extreme observations at both ends of the spectrum are thrown out, or “trimmed.” The inflation rate is then calculated as a weighted average of the remaining components. For the Dallas Fed's series, 24 percent of the weight from the lower tail and 31 percent of the weight in the upper tail are trimmed. 2. In many senses NGDP level targeting is the absolute antithesis of the Taylor Rule. It does not rely on interest rates as the policy instrument for example. It also gives no consideration to the precise mix of inflation and real growth. And it is pure level targeting, not rate targeting. Money is obviously nonneutral in the short run (or at least so my eyes tell me so). The most reasonable explanation for this phenomenon is sticky prices, a concept which you choose to reject. 3. I don't think QE2 has gone overboard by the standpoint of market based inflation expectations. By those measures things are actually exactly where the Fed implicitly wants them to be in the 2, 5 and 10 year time frames. 4. Yes, Canada apperently has implemented IOR without any major negative repurcussions. I'm not familiar with the efficiency arguments in favor of IOR so I can't speak to that. However, one side effect of IOR in a low inflation environment may be surging bank reserves. One can't reasonably complain about the dangerous inflationary potential of such reserves and then defend the reason for their very existence in the same breath. 1. Maybe I'm good at faking that I know something. The Atlanta Fed sticky price index uses some kind of trimming procedure, but it's not period-by-period, but based on the Bils-Klenow data, I think. I think you drop specific prices from the index, much like the CPI ex food and energy. Do you have a theory for the PCE trimming procedure? 2. But with NGDP targeting, there must be something the central bank is supposed to do to achieve the target. What is it? 3. Another thing I thought of is that TIPS are actually indexed to the headline CPI (not seasonally adjusted). How do you think that matters for what we think we are measuring as anticipated inflation? 4. Canada works on a channel system. There is the overnight target rate, and the Bank of Canada typically lends at that rate plus 0.25%, and pays interest on reserves at that rate minus 0.25%. Typically, essentially zero reserves are held overnight. The Bank of Canada appears to extend intraday credit in the payments system to facilitate clearing and settlement, and that outside money disappears at the end of the day. No surging bank reserves, and they have had some pretty low inflation in Canada. Who wants to hold reserves overnight when you can earn a quarter point more in the overnight market? The efficiency argument is essentially a Friedman rule argument. One way to implement the Friedman rule is by paying interest on all outside money. It's not feasible to pay interest on currency, but you can certainly pay interest on reserves. 1)As I understand the Dallas procedure it is simply a matter of dropping those items that change the most from month to month. 2)The CB under NGDP level targeting does exactly what it always does: open market operations. But it does this by targeting NGDP expectations. 3)I don't think the distinction between headline and core is that important over the long run because empirically over the long run they are no different. The main reason for the use of core measurements is the elimination of volatility in the short run. 4)It would appear on first glance at your description that the Canadian IOR system is very different from ours. A big difference in Canada is the overnight market. The fed funds market has orders of magnitude more participants. But you could run the IOR system here in the same way if it was set up properly. We have some goofy rules about not paying interest to GSEs for example. Why are the "New-Monetarists" more concerned about potential inflation taking off, while the "Quasi-Monetarists" are more concerned about monetary policy being too restrictive? You mean Nick Rowe, Scott Sumner, etc., right? Fill me in on what they're thinking. I remember something about an excess demand for money. I can't speak for all, but here is my quick (probably inadequate) summary of what quasi-monetarists believe. 1. The Fed effectively tightened monetary policy in 2008 and helped turn a recession into a 'Great Recession.' For example, see here or here. 2. Monetary policy is not constrained by by the zero lower bound; it is a red-herring and the by-product of central banks using a short-term interest rate as the instrument of monetary policy. Nick Rowe has a good post on this here Along these same lines they argue that such short-term rates are often not a good gauge on the stance of monetary policy. For example, if the neutral interest rate is at 0% and the federal funds rate is at 1%, monetary policy could be tight even though the absolute value of the policy rate is low. 3. Monetary disequilibrium is the key reason for recessions. Nick Rowe had an excellent recent post on this issue here. And yes, an excess demand for money is the culprit here. 1. I think that case is hard to make. The Fed funds rate goes to zero in late 2008, and then there is massive credit market intervention - lending to everyone in sight. 2. I agree that the zero lower bound is not a bound, but maybe for different reasons than what you have in mind. 3. I'm not sure how I can think about this in a coherent way. I know there was an old Keynesian language used the term "disequilibrium," but there is always some well-defined equilibrium in those setups. The prices or the wages are fixed, and then there are specific rules about how everything is determined in those models. A modern New Keynesian model has a well-defined equilibrium. Monopolistically competitive firms play a particular game, and we're looking at the equilibrium of that game. Do you mean that there is some kind of shortage of liquid assets? If so, I've thought about similar things. 1. Expected inflation from TIPS start declining by mid-2008. So does nominal GDP. And of course, after September, 2008 they free fall. The argument is that while the Fed threw everything at the financial system, it ignored these signs that velocity and thus nominal spending were falling. It probably wasn't a conscious thing, but by failing to respond to the decline in velocity the Fed passively tightened monetary policy. Had there been an explicit nominal target that anchored nominal expectations better the collapse of nominal spending would have been far milder. In short, the Fed failed to handle nominal expectations properly and, as a result, a mild recession got turned into the Great Recession. A case in point is the September, 2008 meeting. The Fed chose to leave the ffr at 2%, because they were concerned about rising inflation. The rising inflation, however, was the result of commodity prices. Had they been looking more closely at the forward-looking TIPS inflation they would have seen the market already pricing in a steep decline in nominal spending. Instead they ignored it. 3. I know the term "disequilibrium" is a no-no in a modeling sense, but they idea is there suddenly arose a surge in demand for highly liquid assets. So yes, there was a shortage of liquid assets, but only because the demand for them suddenly spiked. The Fed should have (1) supplied more by buying up more longer-term assets or (2) have established a credible nominal target that would have caused the demand for such assets to subside by bettering anchoring expectations. Yes, it's true the Fed was initially too complacent - i.e. going back to Spring 2008. I'm still puzzled though about how the NGDP target works. What's the operating strategy behind it. The Fed has to decide on something at the FOMC meeting and give a directive to the Open Market Desk. What do they do? Yes, I see what you're after. That's exactly what New Monetarist models can capture (see work by yours truly, Randy Wright, Rocheteau, and Lagos, for example). In those models you can get asset shortages reflected in real rates that are too low. It's not a traditional liquidity problem that you would correct with a cash injection, as the liquid assets that are scarce in financial trade are Treasuries. Macro-economists gave up on fine-tuninig the economy, back in the 1980s after failing terrible at it during the 1970s. All this talk about the Fed should be doing x,y, and z is engineering talk. The economy is not like a well oiled machine which behavior we can finely adjusted simply by turning a knob here and pushing a contact there. While flexible inflation targeting and NGDP targeting works well theoretically, these don't work in practice. To be sure, anything that involves output or the output-gap is doomed to fail in real-life as the estimation uncertainty is huge. Price level targeting could potentially work, but you could end up messing badly with peoples inflation expectations, making them less anchored. Market participants need a fixed number, not something that is time-varying. Inflation targeting - say, 2% average during a 5 year period - is the only viable solution. Yes, I agree on the "engineering" part. On the price level targeting, I was thinking that you always know what to expect, but this would mean having to go to the Board of Governors web page and determine where we currently are relative to the price level target path. Maybe it's too complicated and, like you say, you are pretty much stuck with inflation rate targeting. On another point, I'm never quite sure what people mean when they talk about "anchoring expectations." It's standard Fed talk. Do we mean that the policy rule somehow rules out some bad equilibria where inflation is high? Regarding NGDP targeting, here are several thoughts. (1) My preference would be to adopt a NGDP level target. This would be analogous to a price level target in that it would allow catch-up growth to the NGDP target trend and vice versa. It could be implemented via an interest rate or a monetary base instrument. (2) Level targets are great at keeping expectations anchored while providing short-run flexibility for monetary policy. For example, if the Fed had a 5% NGDP level target and one year it unexpectedly had 2% NGDP growth then the following year it would aim for 8% NGDP growth to catch up to trend. If this approach were understood and believed as credible by the public, then they would know that though there may be unusually high NGDP growth one year to make up for below trend growth, in the long-run NGDP growth would be stable. Thus, nominal contracts could be made with more certainty. (3) NGDP level targeting makes more sense then price level targeting because the former only responds to demand shocks while the latter responds to both demand and supply shocks. See here for more on this point. (4) Though similar, a simple NGDP target dominates a Taylor Rule. This is because the Taylor Rule requires knowing controversial and hard-to-measure variables. For example, what measure of inflation should be in the Taylor rule: headline, core, foward-looking? Also, how can one really measure the output gap accurately and in real time? All NGDP requires is the total current dollar size of the economy. It is already available in monthly form. But there is even better way to measure it as explained in the next point. (5) Though NGDP level targeting would be an improvement in my view, I wouldn't stop there. I would have the Fed target the market's forecast of the NGDP level. This would require something like the creation of a NGDP futures market to really work. The advantage of this is that it would be forward looking and better anchor nominal spending expectations. Stabilizing the expected path of NGDP would in turn bring more stability to current NGDP spending. Scott Sumner has been a really original thinker here. See this article of his on futures targeting. I'm enourmously gratified if I had any influence in drawing Quasimonetarist David Beckworth into this discussion. But I'm too tired to discuss this topic any further just now. I have to lecture a class on Development Economics on the topic of Health at 8AM at Rowan U. tomorrow. And I'm not an expert on HIV, TB, Malaria or Diarheal ailments by any means. I'm curious if we can't find a point of intersection. From my observation of a lecture delivered by Alice Rivlin last night there are precious few people (even those who evidently should know much better) who truly understand monetary economics. Join us. David: what if NGDP has a unit-root? I think the experience in the Volcker regime with targeting of non-borrowed reserves was a failure. Given day-to-day and week-to-week payments systems shocks, a fed funds rate target (except of course with positive excess reserves) as a directive to the open market desk works best. Given that, your NGDP target does indeed seem to be a special case Taylor rule. How can I say, for example, that 5% nominal GDP growth is optimal. Presumably that might mean something like: I think that the optimal inflation rate is 2%, and I think potential real GDP grows at 3%. But just like the New Keynesians, you have to take a stand on what potential GDP is. Seems the output gap is in there, and you have the same conceptual problems as those guys have. I think in general monetary economics has been ignored - both by the neoclassical growth types and by the New Keynesians. There is a group of people out there who I talk to a lot who have been doing monetary economics for a long time - this started with Neil Wallace and his students in the 1980s - Bruce Smith, Rao Aiyagari, for example. There's also the more applied monetary people - Chicago cash-in-advance, Christiano/Eichenbaum, etc. Does "monetary economics" mean something entirely different for you? I get the sense you are much more empirical. "The total stock of reserves will rise to about $1.6 trillion by the end of June, and that represents an accident waiting to happen." Can't that money just be trapped at the Fed instantly if inflation starts to rise by raising the interest rate on reserves? "While it is certainly true that there is nothing alarming on the inflation front if we look at what forecasters are predicting and the yields on TIPS, maybe we should examine some other evidence." "The margin between TIPS yields and nominal Treasury yields is not very large, reflecting modest anticipated inflation." Did you just mistakenly contradict yourself? if we look at what forecasters are predicting and the yields on TIPS maybe we should examine some other evidence. "The Fed can make reserves more desirable to hold by increasing the interest rate on reserves, thus cutting off the incipient inflation, but it will have a hard time doing that. Unemployment may still be high and employment growth slow, and the Fed may not want to be blamed for slowing the recovery." 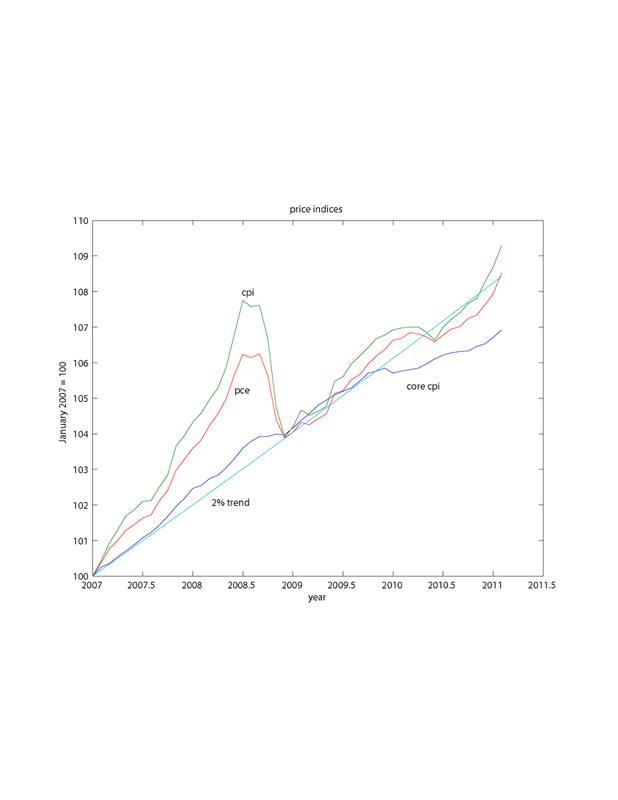 "Here Williamson is making an argument that much of the increase in unemployment is structural. Despite another study suggesting the opposite, I concede there is a reasonable chance that some of the unemployment increase is structural (see David Altig here and here). What I don't agree with is the assumption the Fed will unwittingly miss the shift. Of course, they won't if they are watching wages, which should start to rise earlier than anticipated in the event of a significantly higher structural rate of unemployment." 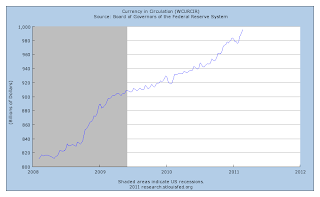 "And don't fall into the trap that some hyperinflation scenario will suddenly sneak up on us. The signs will be evident long in advance, notably sharply rising unit labor costs and nominal interest rates. Those conditions simply have not been yet, leaving no reason to believe we need to rush into policy reversal, either monetary or fiscal." I'll add that a general criticism you have of Krugman/DeLong is that the government increasing employment could, over the long run, be hard to ratchet down and translate into increased private sector employment. But I think the government greatly underspends on high return public investment anyway, so a long term increase in this would be a good thing. In addition, the psychological costs of long term unemployment, the destruction of human capital, the costs to children, the suffering, are such that it's worth some misdistribution anyway to decrease that. Notice I did not say much about what is going on in the labor market. That does not matter for the argument, other than that what is going on in the labor market will, I think, make the Fed reluctant to raise the interest rate on reserves when inflation gets high.